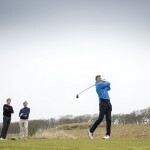 The North East Alliance’s Golf Monthly Final Series suffered a meteorological setback at Duff House Royal yesterday. Even we can’t play golf on an inch of snow. I travelled to Duff House Royal yesterday full of the joys of spring. All the way north from Banchory, the skies were wide and blue with snowdrops and aconites glistening in sunny front gardens. I was feeling positive because I, for the first time ever, was going to an Alliance meeting as a previous winner having come out on top at Montrose last Wednesday. Deep down I knew there was slim to no chance of a repeat because, frankly, nobody could enjoy so much good fortune in two consecutive rounds of golf. 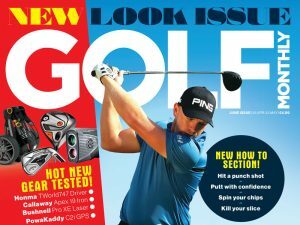 But as we whizzed past green fields and daffodil shoots, I dared to dream that I might just keep the winning run going in the first instalment of the Golf Monthly Final Series. Yes, I knew Paul Lawrie was in the field; yes, I recognised that it would be full course this week so no more putting from 50 yards out; yes, I’ve never posted a score anywhere close to level par at Duff House… But, hey, the sun was shining! So at five over, my hopes of a repeat success were being picked at by the crows somewhere between the 5th green and 6th tee and I reverted to my usual golfing disposition: despondency and self loathing. With the pressure off though, I typically started to play quite a bit better and finished the (far tougher) remaining holes of the front nine in one-under-par. There was a glimmer of hope and my mood was lightening again. What wasn’t lighter however was the sky. It had been looking decidedly black on the horizon from the start of our round and, by the 9th, the horizon was over our heads. It began as rain, then sleet and then turned to snow. Enormous flakes teemed down on the course, covering the fairways and greens within a matter of minutes. As you would expect from members of the North East Alliance, most of us persevered as long as we possibly could. But when it got to the point that we could no longer feel our fingers, couldn’t find our balls and looked more like Arctic explorers than recreational golfers, we were forced to admit defeat and return to the warmth of the clubhouse. I still haven’t warmed up fully. A quick word for Philip Mclean of the Paul Lawrie Golf Centre who was leading in the clubhouse having completed a fine round of 69 before the worst of the weather closed in. In tough conditions on a saturated course, (although the greens had held up well) it was a very good effort. Next week Phil! It would be a good one to pick, as next week is the first round of the North East Alliance Championship at Portlethen. It, plus round two at Craibstone and now also the final extra event at Ellon on March 23, will all be sponsored by Golf Monthly. Now, as the event at Duff House wasn’t completed, I can enjoy another week as the most recent Alliance winner. By next Wednesday, I will have forgotten all about those double bogeys at Duff House and, with luck, the daffies will be ready to bloom. This week’s golfing dream was an anxiety one and it came in two parts. In part one I arrived to play a competition in what seemed to be the back garden of an English country house. There was a green cut out in the middle of a rockery but no evidence of a golf course. I assumed it to be a putting green and dropped a ball down for a putt. Seemingly irrelevant to the dream was the fact the one putt I had caught a huge slope I hadn’t seen and tumbled off the surface and into a bunker that I also hadn’t seen. As I was retrieving my ball from said bunker my dad appeared and shouted over to ask what I was doing on the 18th green. Oh no… So with that very bad putt… I’d effectively been practising on the course. I considered not saying anything but then decided to go and tell the tournament organisers and disqualify myself. They were pleased as they’d seen me do it and were going to have to disqualify me anyway… There’s a salutary lesson in there somewhere. Part two was still set in this English country house which had suddenly acquired a second 18 holes. I decided I would go and play them, having DQ’d myself from the tourney on the other track. Luckily my mate Ross and, for some reason, Ben Crenshaw were looking for a game so we got ready to go out. It took me a while to find it, but when I finally located my bag – my brand new set of Mizuno MP-5s had been stolen. I saw someone running off with them and made chase but I couldn’t quite catch up (welly boot/setting cement-style running) and eventually had to admit defeat. I was so cross that when I got back I snapped the heads off my driver and 3-wood. Ross and Ben Crenshaw were nowhere to be seen.